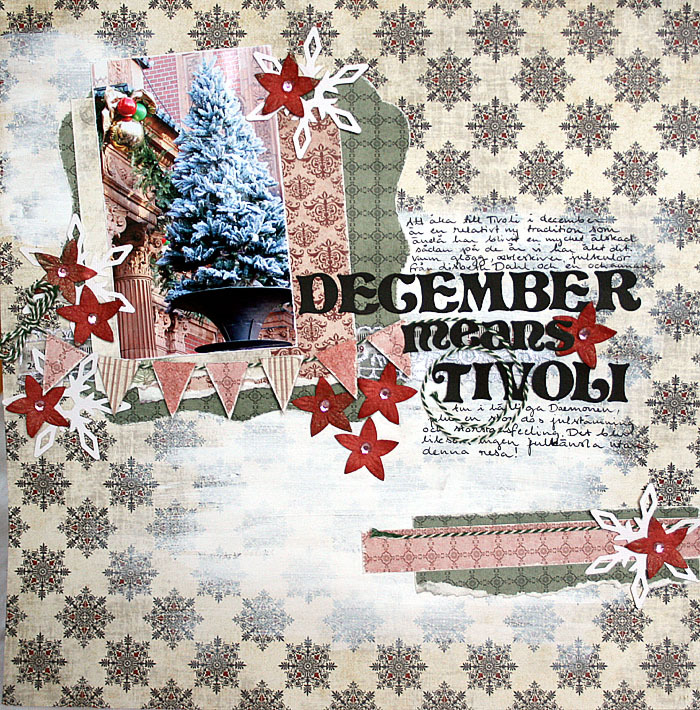 I made this layout for Riddersholm Design with their beautiful papers from A Christmas Story. It's about when we go to Tivoli in Copenhagen every year in December, to get in the right mood for Christmas. The layout is based on this month's sketch from Once Upon a Sketch. Gorgeous Christmas page!!! Thank you so much for playing along with us at OUAS! I wish you Happy New Year!!! Jeg har hørt det skal være vakkert i Tivoli før jul, men har aldri vært der på den tiden av året. Kanskje i 2013? Vakker, enkel side som gir den rette julestemningen. Really pretty page! Thank you so much for playing along with us at OUAS! very beautiful Christmas project! love all those red flowers scattered all over!